It has been a wonderfully cold November here in Stowe which has set us up for an amazing start to the ski season. 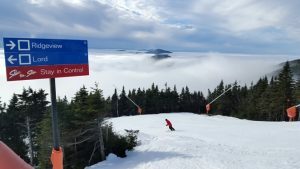 Stowe Mountain Resort opened on November 17th with more skiable terrain than we have seen in a long time this early in the season. Yesterday we got 5-7 inches of fresh snow on the upper elevations which provided us with some lovely soft midwinter like skiing. Thanksgiving is upon us and our Lighthouse Bar & Grill will be serving our Traditional Thanksgiving Dinner from 11:30 to 6 pm on November 23rd. It would be a wonderful time to come up and enjoy Thanksgiving with your family and get everyone started with some early season skiing and riding.